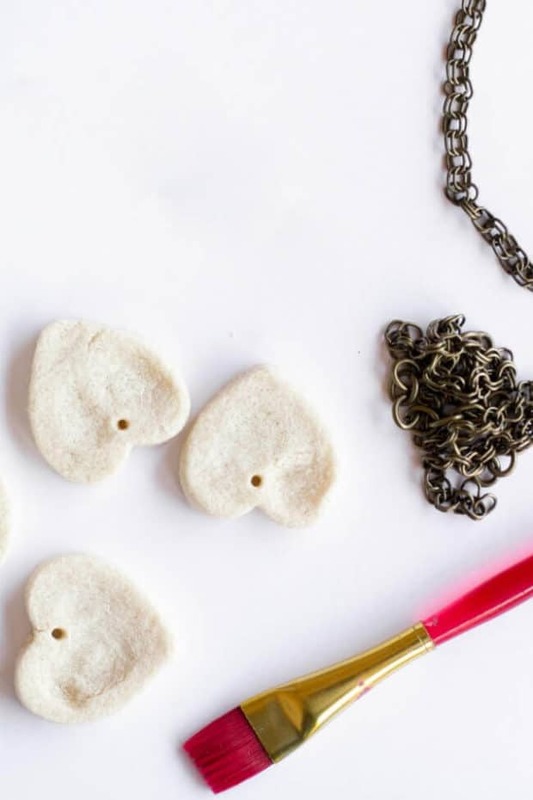 Salt dough fingerprint jewelry is the perfect idea for Mother’s Day — or anytime of year! Oh, I adore my boys! They’re at such fun ages. I wasn’t sure if boys would get into crafts, but mine do. This week we made salt dough together so we could create fingerprint jewelry. I love how these easy thumbprint pendants turned out and I’m excited to share them with you! 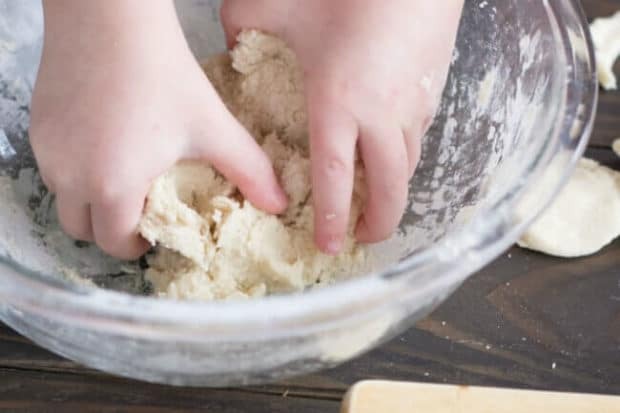 My boys LOVED getting their hands in the ooey-gooey salt dough mixture and they were delighted at my invitation to leave fingerprints. They know I’m usually all about wiping fingerprints away! My guys are old enough to have opinions and real conversations and yet they are both still up to totally cute, little guy antics. The things they say and do have me giggling more days than not. They’re so much fun! We all love to do projects together, which I’m so happy about. The fingerprint necklace we’re making today is a lovely great gift idea — to keep for yourself or to give away. Salt dough is a simple, homemade modeling mix created from flour, salt and water. This DIY salt dough recipe can be used to create ornaments, jewelry and more! We decided to do this project after dinner one night. Salt dough crafts were always a favorite for me when I was a teacher and I love doing them with my boys even more. I thought it would be a great way to end the day together and then we would finish with painting in the morning. I was right! 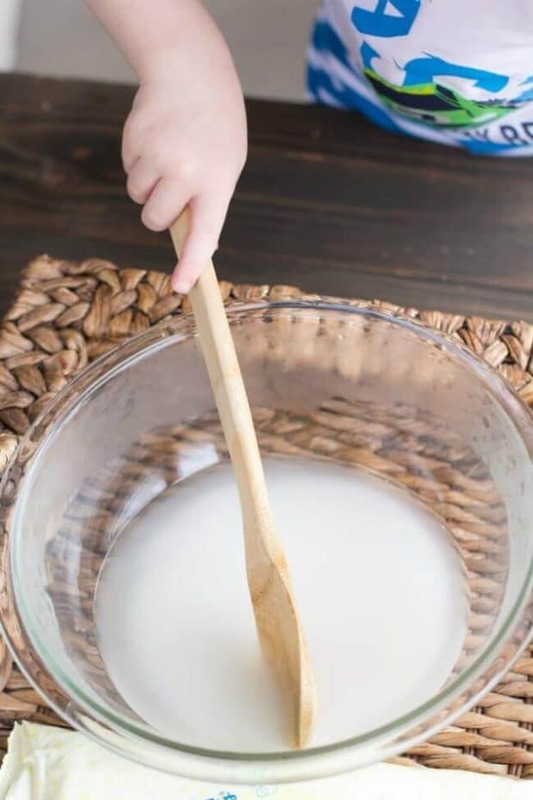 The salt dough recipe was easy to create and the boys had so much fun squishing it in their fingers. This is the best salt dough recipe I’ve used — and it couldn’t be any easier! You’ll need a cup of hot water, a cup of salt and two cups of flour. To create this quick DIY dough, you’ll mix all the ingredients together until a ball of dough forms. If too dry, slowly add more liquid to get to the right consistency. I had to explain to my boys that it wasn’t cookie dough, even though it looked like sugar cookie dough and we were using cookie cutters in it. For this recipe, you don’t have to cook the dough. Just make sure you use hot water in your mix! Do You Have to Bake Salt Dough? If you’re creating salt dough handprints or salt dough ornaments, then you should bake your designs when you’re finished so they harden. My mom has some ornaments I created for her when I was in kindergarten… I won’t say how long ago that was! I can definitely appreciate that this is a project that will last for years to come. 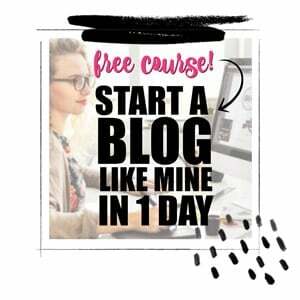 You’ll want to gather a few supplies. I got these items out while my boys were busy mixing the dough. You’ll need a cookie cutter, paint, toothpick, rolling pin and a necklace string, ribbon or chain. 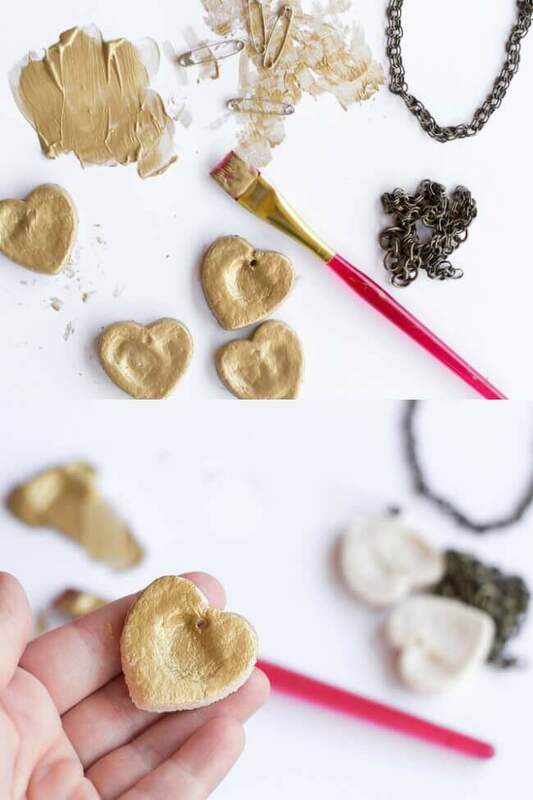 We chose to do heart pendants to turn into necklaces. You’ll roll the dough out to 1/4 inch thick. Then use a small heart cookie cutter to cut the shape. Press your child’s thumb on either side of the heart. Use a toothpick to make a small hole in the top for string. Make sure it’s big enough to slide onto your chosen necklace. When you’re satisfied, bake at 200 degrees for 1-2 hours until hardened. After it cools, you can paint with your favorite color of acrylic paint and let dry. To finish, add your desired necklace string. You could take this same idea to make saltdough ornaments for the holidays, too! Big salt dough handprint ornaments are such a fun way to see how little your kiddos hands were. Of course, they seem so giant when you first make them, but reflecting years later, you’ll see how tiny they actually were. When our necklaces were finished, the boys “wrote” letters to both of the grandmas (colored scribbles and pictures mostly but grandmas are good interpreters). They were so excited to mail their surprises to the grandmas. And my husband and I were gifted with the jewels, too. I proudly wore mine all day, much to the boys’ delight. I’m thinking this will be one craft that gets tucked into my keepsake box. 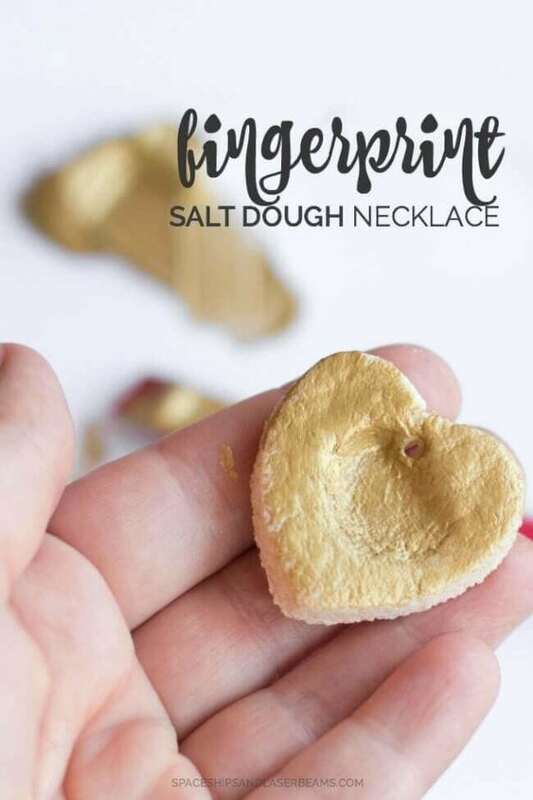 I hope you enjoy making salt dough fingerprint jewelry with your little ones soon! Mix all ingredients together until a ball of dough forms. If too dry, slowly add more liquid to get to the right consistency. 1. To make heart pendants, roll dough out to ¼ inch thick. 2. 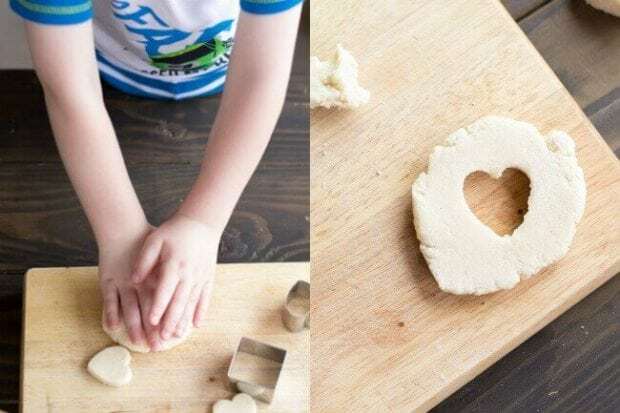 Use a small heart cookie cutter to cut shape. 3. Press child’s thumb on either side of the heart. 4. Use a toothpick to make a small hole in the top for string. 5. Make sure it’s big enough to slide onto the necklace string. 6. Bake at 200 for 1-2 hours until hardened. 7. Paint with favorite color of acrylic paint and let dry. 8. Add desired necklace string.